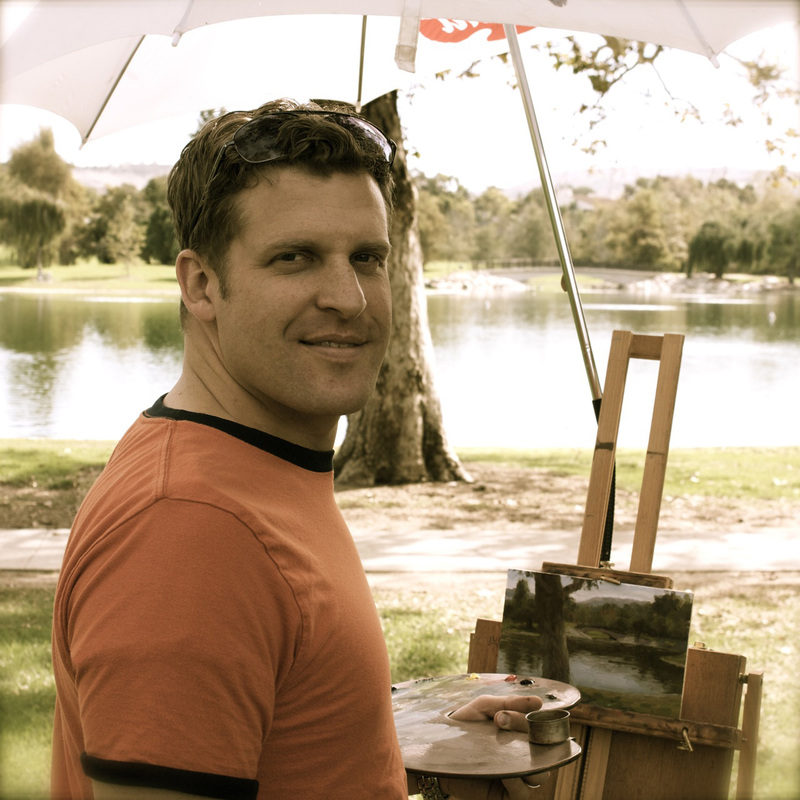 Justin Kunz is a painter and illustrator and is currently an Assistant Professor in the Department of Visual Arts at BYU. Previously, he worked at Blizzard Entertainment creating concept art, environment textures, and building 3D assets for World of Warcraft. He was a Lead Texture and Concept Artist at Disney Interactive Studios. 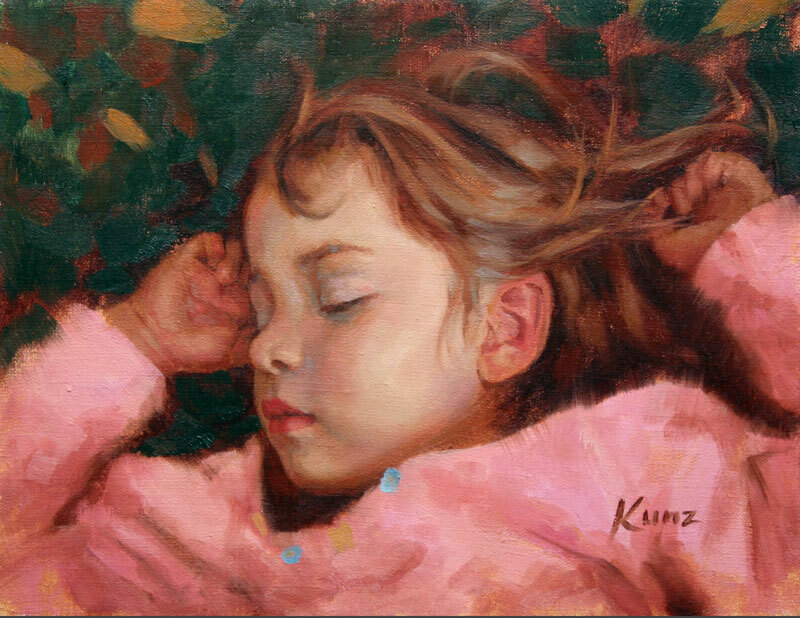 Kunz was also selected to be a master designer as part of the Artistic Infusion Program with the US Mint and he has had three designs minted. Describe yourself as an artist. I live in a perpetual state of amazement at the beauty that is practically everywhere I go. I understand not everyone experiences the world this way, so I try to act normal just to blend in. I could blame my college education for burdening me with a mind attuned to this impractical kind of awareness, because that was the time when I felt like I had finally begun to see. But I have memories of the awe induced by visual experiences that predate any formal training. That makes me wonder if part of my sensibilities are the result of something more primal. Maybe I’ve always been this way. I guess that’s what people probably mean when they say, “You’re so talented.” I once saw a T-shirt that said something like this: HARD WORK IS FOR PEOPLE SHORT ON TALENT. Silly me, I thought, I’ve been working way too hard on my art! It came as a great relief to learn, after more than 20 years of continuous efforts to improve myself as an artist, I can just kick back and relax because, as so many people have assured me, I’m talented! But in all seriousness, I still find myself working many long, focused hours because I haven’t figured out how to produce high-quality art using talent alone. The component of craft is integral to the way I create, and that is something that takes time. 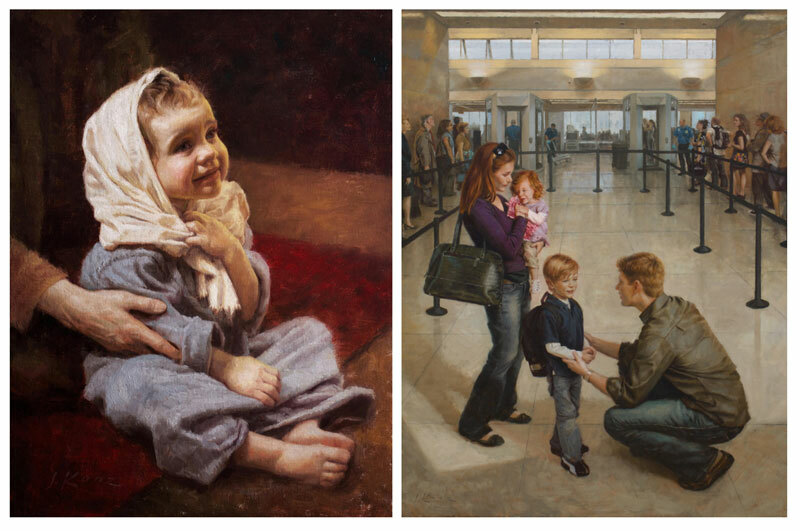 Your figure paintings are really great–how do you choose your subject matter? Thank you. In the case of commissioned pieces such as the coin and medal designs, concept illustrations, and some of the paintings, the subjects vary depending on the needs and interests of the client. For me the unifying theme seems to be a desire to tell stories visually, in a way that conveys a sense of spiritual resonance. Sometimes those stories are historical, other times fictional; some are scriptural, others fantastical. I have a variety of interests and many more ideas than I have time to develop into finished paintings. So I have to be patient and try to choose the right projects at the right time. 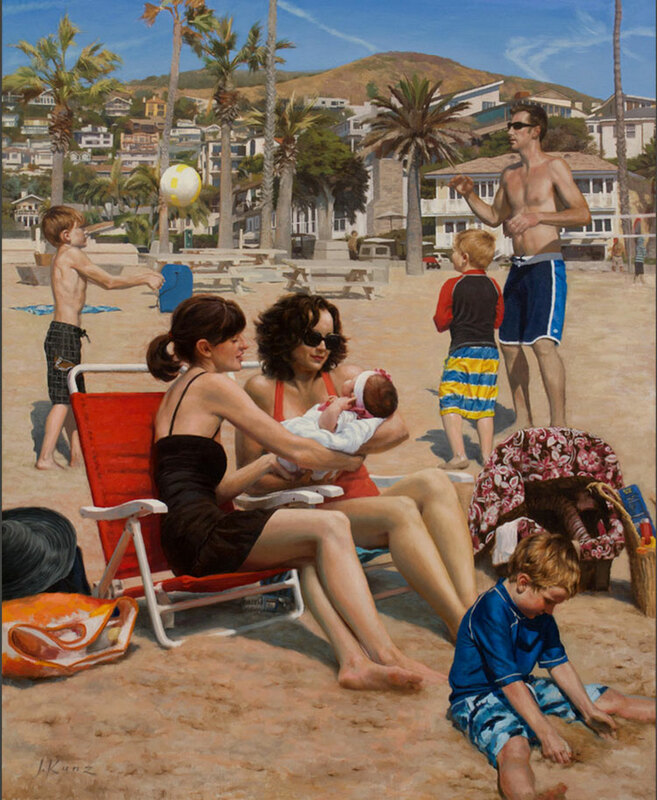 I also love to paint landscape, but most of my recent work has involved figures in some way. The style of my work is a function of both the process of its creation and the particular sense I have about the subject—not only what it means, but how my ideas and feelings about it might be expressed through a series of aesthetic choices. How does your religion shape your artwork? Obviously not all of my artwork is overtly religious in nature. In fact, it has only been the last three years or so that I have really started to paint scriptural themes. I illustrated several articles in Ensign and Liahona during the first five or six years of my career, but most of those were contemporary subjects. The Biblical paintings are a more recent development. For a long time, I was reluctant to try painting pictures of the Savior. Not because I didn’t want to, I just never really felt ready (maybe worthy would be more accurate). I wasn’t always happy with the way other artists portrayed him, but I also questioned my own ability to do justice to these sacred subjects. I still have some of those doubts, but I knew it was something I wanted to do eventually, and putting it off didn’t feel right either. So when Dallan Wright from Deseret Book came to my studio and challenged me to try painting a New Testament theme, I took him up on it. 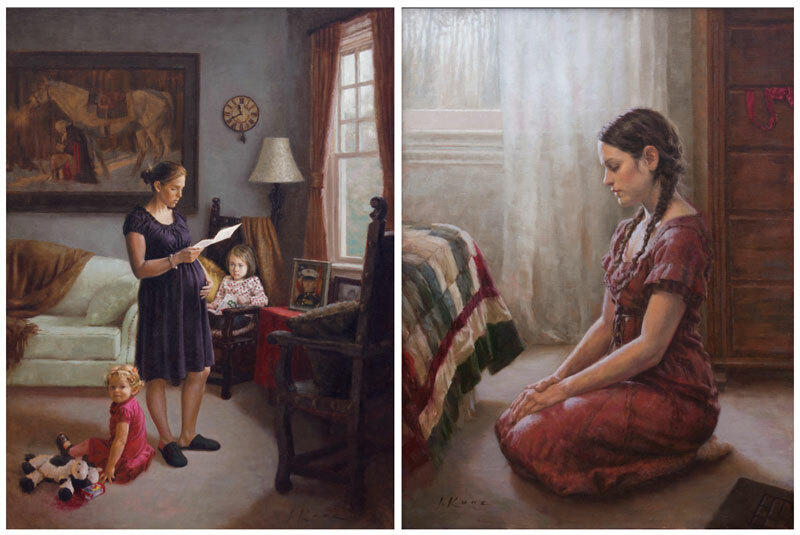 That piece, On Earth as it is in Heaven, which is a portrayal of the Lord’s Prayer during the Sermon on the Mount, has been included in several exhibitions including a few national competitions. The artists I admire most have found a way to express some aspect of their faith in almost everything they create, whether that expression is direct or indirect in nature. It’s that kind of artist I aspire to be. Follow Justin Kunz on Instagram.